The City of Corvallis has three Enterprise Zones: South Corvallis, Sunset Research Park, and the Hewlett-Packard campus. An enterprise zone exempts only new property that a job-creating business might build or install in the enterprise zone at some future time. Also, an enterprise zone exemption is temporary, usually lasting only three years, after which the property induced by these incentives is available for assessment. The State of Oregon has other incentives, including a range of tax credits and energy incentives. Oregon is one of four states without a sales tax. 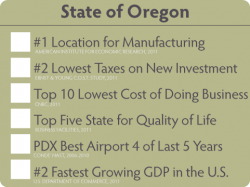 A 2011 report by Ernst and Young on the best states for business, pronounced Oregon has the second-lowest business taxes on new investments. The State collects net income taxes on corporations and personal income; local government is funded by property taxes. Taxes levied includes Personal and Corporate Income Tax, Employment Tax, Workers Compensation, which has a lower rate structure. Oregon also has low Motor Vehicle fees. Capitol – Gov. Office, Capitol Bldg., Salem OR 97310; 1-503-378-4423. Consolidated compressed property tax rate for the fiscal year of 1999-2000 in Benton County was $16.75/$1000 est. The Cities and Benton County have no general business licenses/fee.